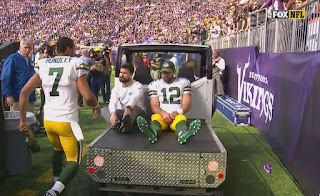 Aaron Rodgers has a broken collarbone and the Green Bay Packers have to rely on Brett Hundley under center. Now what? It's a brutal hit for multiple owners in fantasy football leagues as Jordy Nelson, Davante Adams, Randall Cobb, Ty Montgomery and even Aaron Jones all lose value. The Packers play the Saints in week 7 before a week 8 bye. Brett Hundley threw 3 interceptions after Aaron Rodgers left the game against the Vikings and the Saints defense just forced Matthew Stafford into 5 turnovers and scored three touchdowns! That was the second time in 3 weeks New Orleans defense had three interceptions. Stafford and Deshaun Watson are on bye in week 7, so you could be fighting owners on waivers. Jameis Winston suffered a shoulder injury on Sunday so there might be another owner looking for a security blanket as well. Don't spend too much FAAB on a QB, better off streaming! Let's take a look at the next three weeks. Tyrod Taylor (36% owned Yahoo) is probably the best option for most fantasy owners as a permanent solution, despite a lack of weapons on offense. The Bills are coming off a bye week and will face the Bucs and Raiders at home before playing the Jets on the road - three plus matchups. Andy Dalton (46%) has four road games in the next 5 weeks, but he does have a WR named A.J. Green! Trevor Siemian (42%) has three straight road games at Chargers, Chiefs and Eagles.